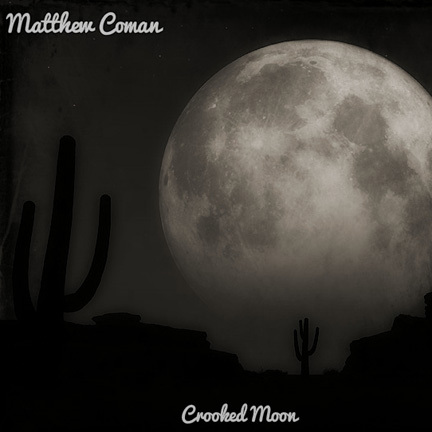 Matthew Coman explores some folk ambitions on his new album “Crooked Moon.” Whether it is the country tinged “I’d Love To Stick Around” or the Dylan-esque “Not Talking Anymore” you can feel the singer/songwriter in Coman thriving. “Ol’ Danny” is another story song that examines reaching for something that may be just out of reach paired with vivid imagery like “records spread out on the floor.” The song also features a banjo prattling through the song to make it stick out as one of the album’s best moments. Not to be pigeonholed, Coman gets into a rootsy jam on the album opener “Walk Down.” He later indulges into a head-shaking bluesy groove on “Post-Apocalyptic Driving Song” that pushes the limit more than anything else on the record. He still thrives when the throttle isn’t quite on the floor like on the lyrical Pandora’s box that is “Not Talking Anymore” or simple songs of devotion like the sweetness of “I Just Can’t.” Some slower songs like “Shallow Grave” and “Love To Call My Own” find the ravenous inner-Coman reaching for something more and hitting an emotional nerve. This album represents Coman better than anything else he has released, mixing his country side with blues and even some hard rock, all the parts that makes him what he is. The dominant language here is alt-county, folky songs but don’t be fooled, Coman never lets any tempo wear too thin through the 14 tracks and creates a solid sampling of the different gears he has. This entry was posted in 250 word album reviews and tagged 250 word album review, 3.5 Stars, album review, alt-country, Americana, Crooked Moon, folk, Matt Coman, Matthew Coman, Missouri, St. Joseph. Bookmark the permalink.